The fish-eating seabirds have been washing up between the northern Wadden Islands and southwestern Zeeland—all showing symptoms of severe starvation, a marine biologist said. "What's killing them though is the million-dollar question," Mardik Leopold, a maritime researcher for Wageningen University, told AFP. "And we still don't know what the answer is. It's an alarming situation," he added. "The last time we saw high mortality rates like this was in the 1980s and 1990s." The bird deaths are confined only to Dutch shores—nothing has been reported in Belgium or Germany. 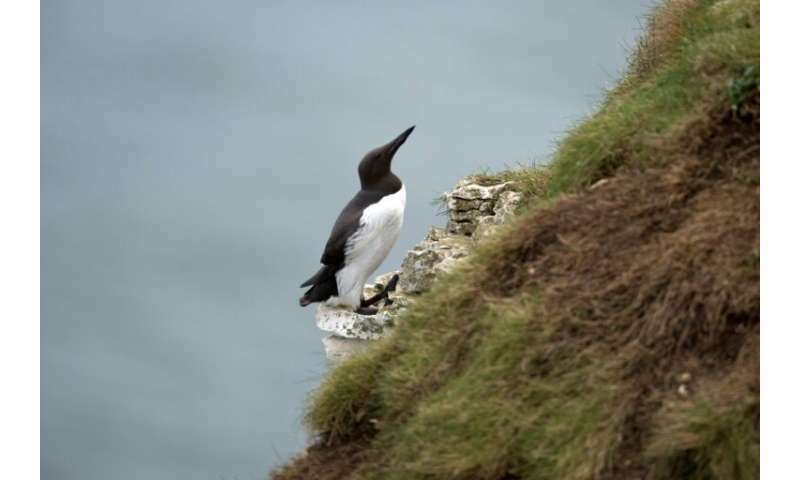 High winds and stormy winter seas also could affect the birds' feeding patterns on herring and sprat as they become too fatigued to eat, Leopold said. "But again, why are the deaths only localised to the Netherlands? Surely we're not the only place experiencing winter weather?" said Leopold. Dutch media have raised the question of whether the deaths may be linked to a recent container spill, littering the Dutch and German coast lines with debris, including plastic toys, polystyrene, shoes and at least one bag with a dangerous powder identified by authorities as "organic peroxide." But Leopold said an initial autopsy on a small number of birds showed "no plastic" in their stomachs. "The birds were not covered in oil either," he added.